Google AdWords allows businesses to address their clients directly. However, certain guidelines should be followed; otherwise this kind of marketing can quickly become very expensive. This article appeared in today’s edition of Neue Zürcher Zeitung, Switzerland’s newspaper of record. Google search terms like ‘cheap beach holidays’, ‘stylish trainers’ or a comparison of ‘health insurance premiums’ quickly yield results. A closer look at these same results shows that the best placed ones are marked as adverts. That means that these companies pay Google every time this search result is clicked, regardless of whether it sells a holiday afterwards or not. This advertising is called Google AdWords. It is an ingeniously simple concept and the most important source of income for the search engine. Many users do not recognise the advertising for what it is – if they did, they might feel a little indignant. It is a way for businesses to run targeted advertising campaigns with some precision. Companies can lose a lot of money however, if it’s done the wrong way. Stefan Vetter knows how to do it right. His company Wortspiel.com specialises in advising startups about how to use AdWords. The cost per click for each search term depends on two factors, he says: firstly, a website’s relevance to that topic and, secondly, the corresponding level of competition for that term. For example, whenever someone wants to post a letter and searches for ‘stamps’ online, then there is a supplier in Switzerland offering precisely that i.e. the post office. Therefore this search term will be priced relatively favourably. However, if you search for something that many different people are offering, like insurance, holidays or personal loans, then the cost per click will be much higher for the advertiser. The price ranges from a few centimes to hundreds of franks for the most expensive English search terms (“claims solicitors” for example). It used to be said that half of every advertising budget would be wasted anyway, only it would be impossible to know which half. With AdWords that is not the case. Running an online business means being able to monitor conversion rates exactly i.e. how many paid visits result in a sale. The trick is to find word combinations that entice those visitors who really mean to buy something. However, AdWords cannot create demand. Even in the digital age high-end brand recognition must be built up over the long term – a process that would include placing adverts in newspapers and magazines. AdWords is best suited for winning those customers that have already made a decision to buy. “Every internet search is the expression of a need”, says the AdWords specialist Stefan Vetter. As an example, the Swiss German term ‘zügeln’ (to move house) was taken up by the Zürich startup Movu. People organising their moves with Movu receive offers from removal and cleaning companies. With around 2000 customers a month Movu has a significant share of the Swiss house moving market, says their founder Laurent Decrue. The startup employs 20 people and a dozen developers. It had to grow quickly to forestall any attempt by other parties to copy the business model. “AdWords was perfect for this because you could just get started right away”, says Decrue. By now clients are coming to Movu through referrals and as a result of partnerships with real estate portals. However, negotiations with partners take time so AdWords still makes up a third of their five figure monthly marketing budget. Simply buying keywords is not enough. “Firstly the relevance of the website needs to be enhanced. That means you need to present your product in the right terms”, says Stefan Vetter. Search terms of the advertising text and the landing page of the website must harmonise and be consistent with one another. “Small businesses must consider carefully how clients will be able to get through to them”, says Carl Jung, Director of Studies at Nativespeakers.ch who offer private English tuition and translation services. Initially he thought people would decide on a certain company primarily on the basis of recommendations. Yet this assumption proved to be false. The number of enquiries his risen significantly though, along with the turnover, since working with AdWords. If a company is active in a competitive sector where businesses spend a lot on marketing, then things can get a little dicey. This leads to certain search terms becoming very expensive indeed; so much so that it would be impossible use them profitably. Many small and medium-sized companies still do not use AdWords at all, even though it is still feasible with smaller budgets. Those responsible for this simply lack online marketing experience. Either that, or there is not enough pressure to tackle the issue head on. There is an unwritten law in Switzerland, unknown abroad, that one may not book the brand name of a competitor as a search term, although this would not be, strictly speaking, illegal. Another challenge presented itself for Michael Bäuerle, founder of Folienwerke.ch. This company specialises in putting together templates and presentations using PowerPoint. It numbers among its clients such companies as Roche & Raiffeisen. As ‘PowerPoint’ is an expensive search term, initial outgoings for this 2015 startup were high. Other approaches to acquiring new customers proved unproductive. And it always takes time to build up a reputation. 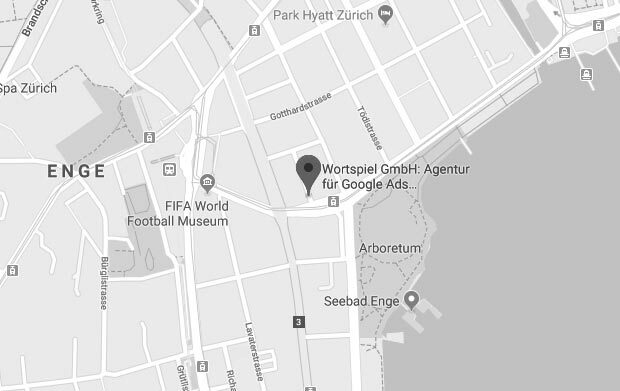 At least AdWords allows an advertisement to appear, for example, just in Switzerland and not Germany. This optimisation, coupled with other ways of tailoring AdWords to individual requirements, allowed Bäuerle to half his marketing budget for this channel. The principle of AdWords is simple. Nonetheless those new to the field of online marketing may be quickly overwhelmed by it all. It is all too easy to spend more than you get out of it. PS Would you like to grow faster with AdWords? Then we would be happy to hear from you.